Tutto pronto quindi per il debutto stasera del grandioooso spettacolo dei Westbrook con l'Artchipel Orchestra e Pete Whyman: a Milano, per Il Ritmo delle Città, all'Orto Botanico Città Studi di via Camillo Golgi, con inizio alle ore 21.30. 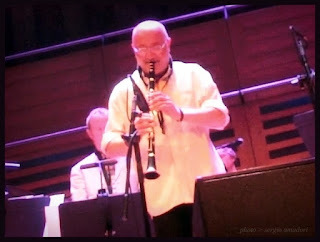 Il concerto vede impegnata l'Artchipel Orchestra con uno dei più grandi musicisti, compositori e arrangiatori contemporanei per orchestra jazz: Mike Westbrook. Dopo quasi vent’anni Westbrook ritorna a Milano per una serata unica in compagnia della moglie Kate (cantante, musicista e autrice dei testi) e del sassofonista Pete Whyman. 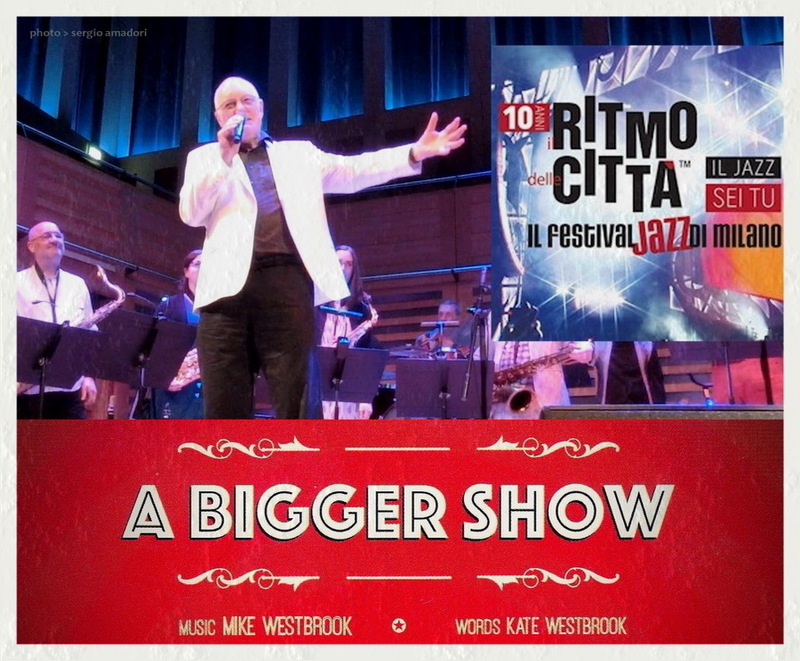 Insieme propongono in edizione italiana “A Bigger Show”, l’ultimo lavoro orchestrale di Mike e Kate Westbrook, che hanno appositamente riarrangiato per l'Artchipel la partitura originale scritta per la propria Uncommon Orchestra. 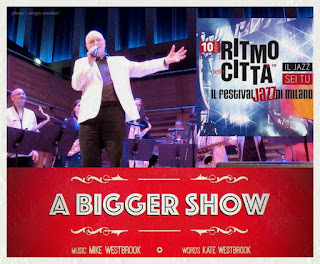 “A Bigger Show” è un intrattenimento jazzistico di altissimo livello, un omaggio al vaudeville, al cinema di Fellini, al circo, al teatro, al jazz degli anni trenta. In questo nuova versione pensata per Artchipel, i testi delle canzoni rimarranno in inglese, mentre i dialoghi e le parti narrative saranno in italiano, in una traduzione commissionata da Mike e Kate Westbrook ad Alessandro Achilli e Sergio Amadori. Different Times, Different Places: un secondo volume di rarità e sessioni inedite di Harry Miller con amici e compagni di tante avventure - Keith Tippett, Louis Moholo, Trevor Watts e Alan Wakeman tra gli altri - intessute tra il dicembre 1977 e il settembre 1982, e ricomposte in prezioso arazzo per l'etichetta Ogun dal compianto Mike King. 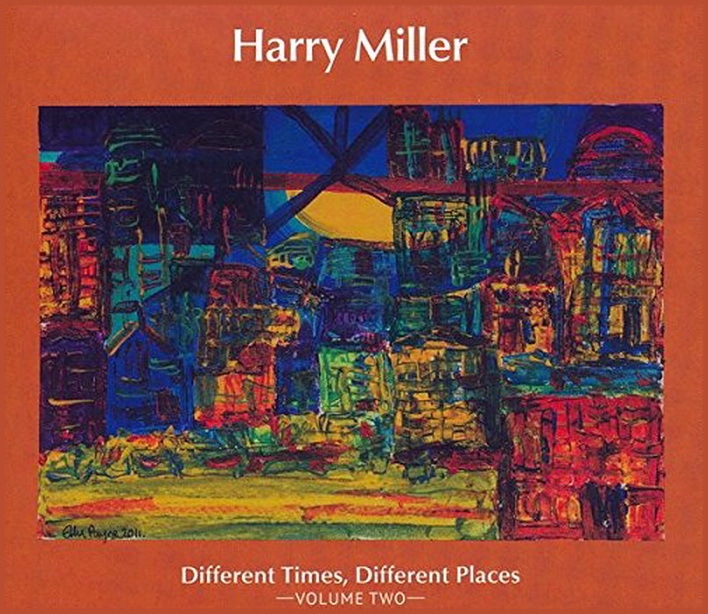 Fantastic work from the late bassist Harry Miller – an artist whose rich contributions to the British jazz scene are only finally being given their due, thanks to a wonderful collection of unreleased material like this! Miller was a key force in linking the sounds of the South African Blue Notes group with some of the freer sides of the British scene in the 70s – a role that he played both as a musician, and as a warmly encouraging contemporary – one who would often hide his own presence behind that of other artists – all the while inspiring them with his own energy and vision. This collection adds some beautiful Miller material to the all-too-short list of records issued under his own name – and it draws from three different unreleased sets, all of them pretty darn wonderful! Reedman Trevor Watts is on all three sessions – as is drummer Louis Moholo – and this core trio collaborate with reedman Alan Wakeman and guitarist Bernie Holland on the track "Orange Grove" – then move to work with Wakeman and pianist Keith Tippett on "Miss Liz, The Magician", and "Door Key". 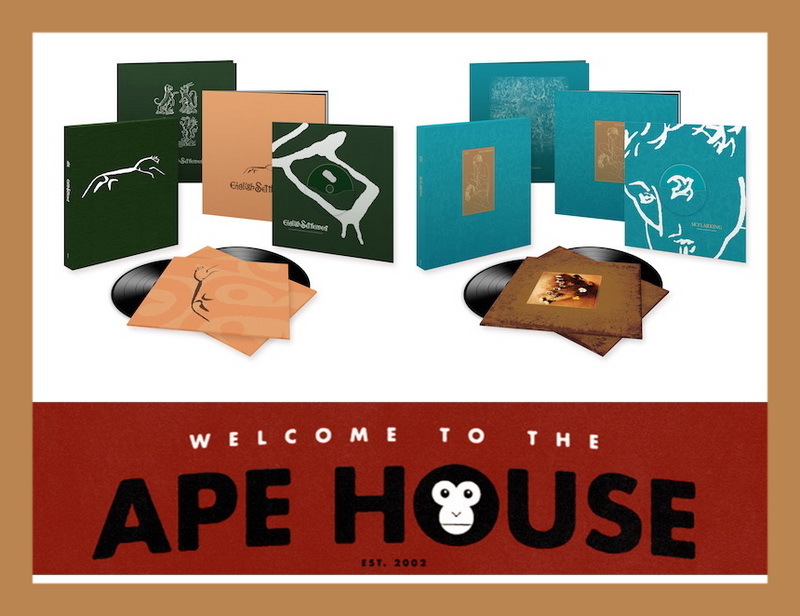 The last three tracks – "Ikaya", "Mofolo", and "Down South" – feature beautiful trombone from Alan Tomlinson and trumpet from Dave Holdsworth – and all the titles have that mix of blue chords and soulful currents that we love in the Blue Notes' work, with some occasional freer moments on the solos. 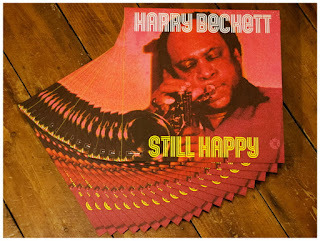 Esce per l'etichetta My Only Desire Records in un'edizione in vinile a tiratura limitata un bell'inedito di Harry Beckett registrato negli studi radiofonici della BBC nel 1974: Still Happy. Con il trombettista c'erano in quell'occasione Alan Wakeman, Don Weller, Brian Miller, Paul Hart, John Webb e Robin Jones. Scrive Richard Williams: "One of the most distinctive London-based improvisers of his generation, Beckett enjoyed a reputation within the jazz community that was never matched by wider public recognition. 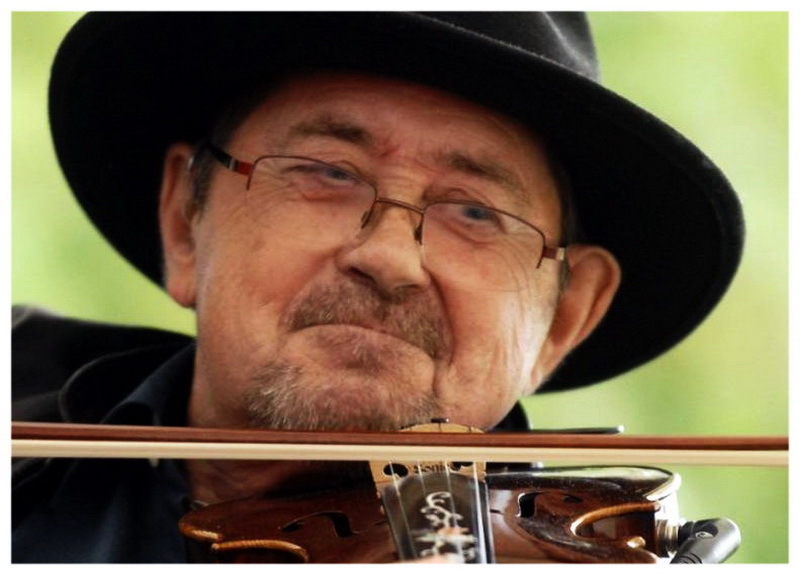 His membership of bands led by Graham Collier and Chris McGregor, as well his various solo projects, meant that his work was quite effectively documented, but much remains to be exposed to today's listeners, particularly sessions recorded for BBC Radio. A new vinyl album titled Still Happy represents the rescue from archive obscurity of a session recorded for Radio 2's Jazz Club in 1974. It contains three tracks, totalling just under 30 minutes of music, and features some of his regular musical companions: the saxophonists Alan Wakeman and Don Weller, the electric pianist Brian Miller, the bass guitarist Paul Hart, the drummer John Webb and the conga player Robin Jones. Harry's work on trumpet and flugelhorn possessed characteristics that, although immediately identifiable, are hard to summarise. Superficially there was a variation on the little-boy-lost quality that Kenneth Tynan ascribed to Miles Davis, blended with some of the untethered lyricism of Don Cherry: an unusual combination of deep poignancy and an irrepressible optimism. Two other factors, however, were of equal importance. The first was the Barbadian-born Harry's very personal intonation, something he shared with a number of musicians of Caribbean origin who turned to jazz in that era. 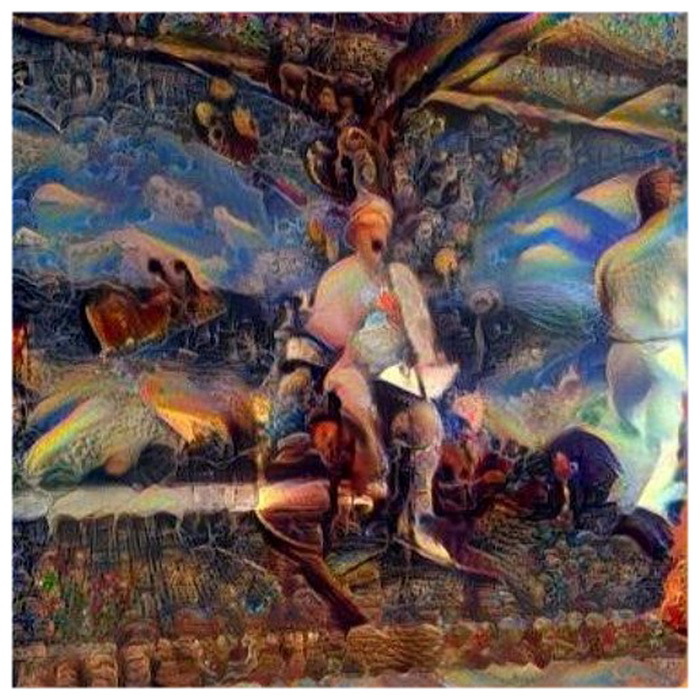 The second was his freedom from the restrictions of rhetoric, by which I mean that his solos did not proceed in the expectation of climax or even resolution but existed from moment to moment, climaxes sometimes arriving and disappearing within a single phrase, so that the improvisations were ordered on a kind of micro-cellular level. 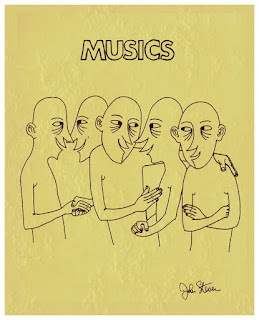 By 1974, too, it was impossible to miss the closeness of his engagement with the prevailing rhythmic flow." 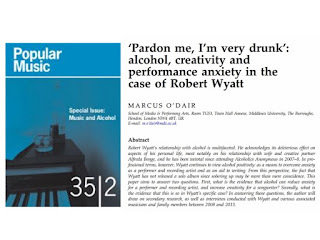 E a proposito di alterazioni, Marcus O'Dair scrive del rapporto di Robert Wyatt con l'alcool in uno speciale numero del periodico Popular Music, edito da Cambridge University Press, facendo tesoro delle molte dichiarazioni (anche) sul tema raccolte nella preparazione di Different Every Time: ‘Pardon me, I'm very drunk’: alcohol, creativity and performance anxiety in the case of Robert Wyatt. 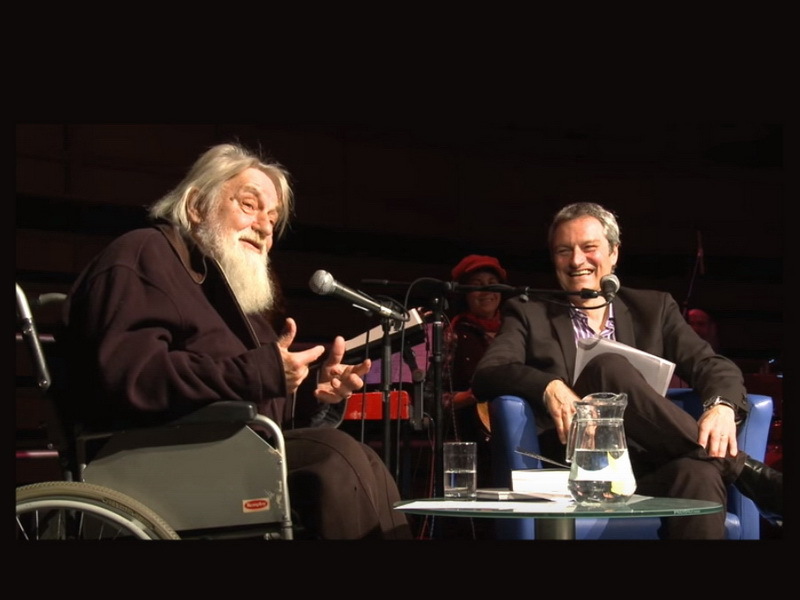 Robert Wyatt's relationship with alcohol is multifaceted. He acknowledges its deleterious effect on aspects of his personal life, most notably on his relationship with wife and creative partner Alfreda Benge, and he has been teetotal since attending Alcoholics Anonymous in 2007–8. 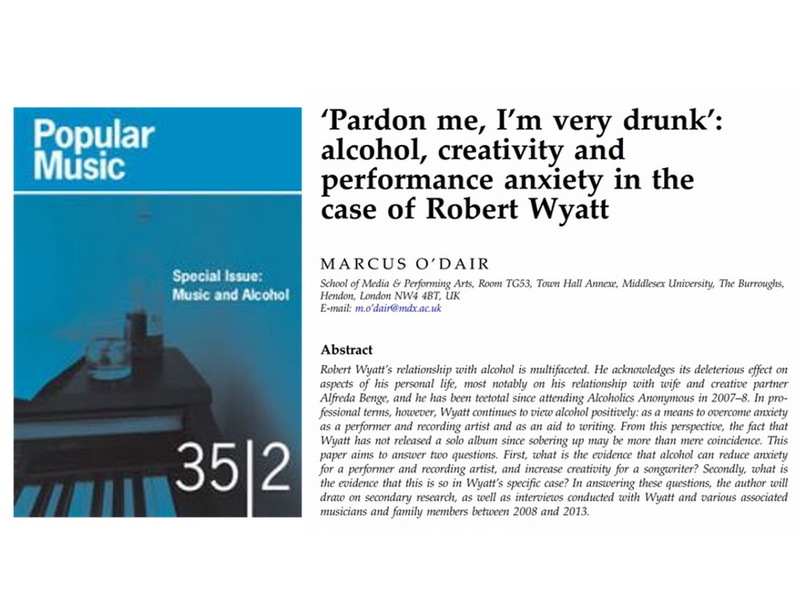 In professional terms, however, Wyatt continues to view alcohol positively: as a means to overcome anxiety as a performer and recording artist and as an aid to writing. From this perspective, the fact that Wyatt has not released a solo album since sobering up may be more than mere coincidence. This paper aims to answer two questions. First, what is the evidence that alcohol can reduce anxiety for a performer and recording artist, and increase creativity for a songwriter? Secondly, what is the evidence that this is so in Wyatt's specific case? In answering these questions, the author Marcus O'Dair draws on secondary research, as well as interviews conducted with Wyatt and various associated musicians and family members between 2008 and 2013. 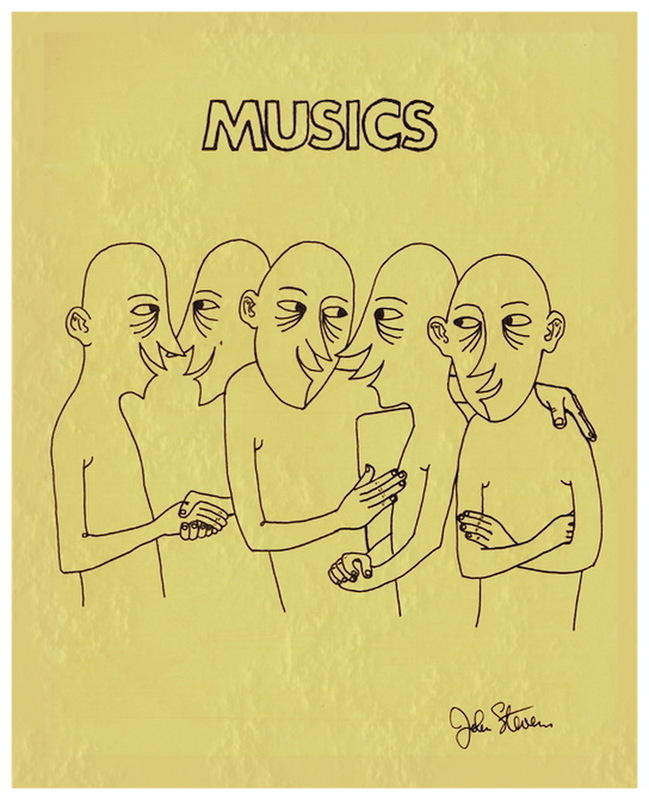 Popular Music is an international multi-disciplinary journal covering all aspects of the subject - from the formation of social group identities through popular music, to the workings of the global music industry, to how particular pieces of music are put together. The journal includes all kinds of popular music, whether rap or rai, jazz or rock, from any historical era and any geographical location. 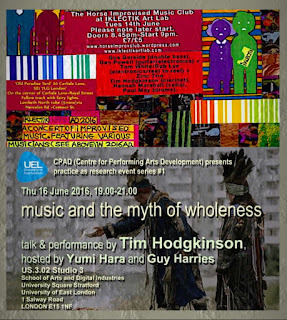 Popular Music carries articles by scholars from a large variety of disciplines and theoretical perspectives. Each issue contains substantial, authoritative and influential articles, shorter topical pieces, and reviews of a wide range of books. 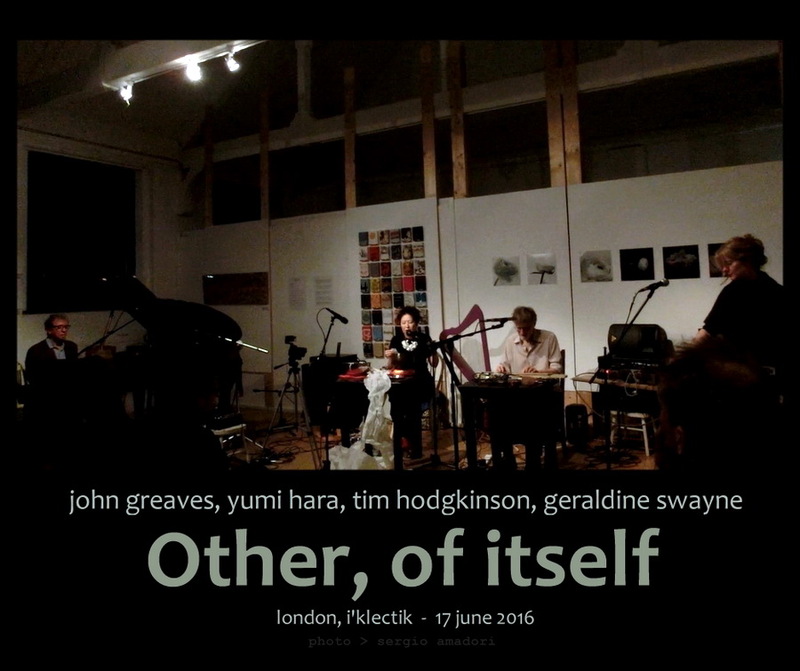 Alcune gallerie fotografiche su FB documentano la speciale serata tenuta all'I'klectik londinese la settimana scorsa da Yumi Hara, Geraldine Swayne, Tim Hodgkinson e John Greaves, con diversi momenti musicali raccolti sotto il titolo Other, of itself. Prima delle azioni in duo, trio e quartetto, Greaves ha ricavato per sé un'ampia parentesi solitaria, offrendo in sublime sequenza The Green Fuse, Chanson d'automne, The Thunder Thief, Walking on Eggshells,The Same Thing, Dead Poets e God Song. 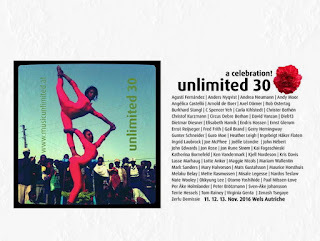 C'è attesa e già clima di gran festa per la trentesima edizione del festival Unlimited a Wels (Austria), annunciata per novembre dall'11 al 13. Per ora trapela solo la lista degli invitati: impressionante! Ein Jubiläum steht an: Das Festival music unlimited feiert im Jahr 2016 seine bereits dreißigste Auflage. Ein solches Jubiläum will selbstverständlich dem Anlass entsprechend feierlich begangen werden. Von 11. bis 13. November versammeln sich deshalb MusikerInnen aus Österreich und der Welt rund um den Alten Schl8hof in Wels/Oberösterreich, um gemeinsam mit einem ebenso internationalen Publikum in grenzüberschreitenden musikalischen Reisen die hohe Kunst des Zuhörens zu pflegen. Die dreißigste Ausgabe von music unlimited bietet Weltmusik im besten Sinne. KünstlerInnen aus allen fünf Kontinenten werden auf den mehreren Bühnen der Stadt ihre unterschiedlichen Zugänge zur Klangerzeugung und -verarbeitung vorstellen. Ein Jubiläum bietet aber stets auch Gelegenheit zur Rückschau: Seit 25 Jahren wird das Programm des Festivals alle zwei Jahre von einem/r international bekannten Musiker/in gestaltet, zahlreiche der ehemaligen KuratorInnen werden deshalb bei der Jubiläumsedition auftreten. Da jedoch jeder Blick zurück auch ein Blick nach vorne sein sollte, werden die KuratorInnen ihre aktuelle Arbeit in neuen, oftmals ungehörten Projekten darbieten. Das Spannungsfeld von Kontinuität und Neuerung steht also auch bei der dreißigsten Auflage des Festivals im Fokus. Scott Harwood era tra gli artisti locali che si esibirono nel piccolo club The Rails a Byron Bay (Australia) quando Daevid Allen diede la sua ultima lettura di poesie in pubblico, poco più di un anno fa. Ne ha ripreso la voce recitante quella sera - era il primo marzo 2015 - e successivamente ha messo a punto un brano in suo omaggio, I'm Sorry. Lo si ascolta oggi tramite Soundcloud: "A piece of music I've been working on since 2013. A session on the isle of Berneray in July 2013 gave me the guitars. Daevid Allen's final public performance at the Rails in Byron Bay on 1/3/2015 gave me the vocals (I was one of the supports that day...). A session at my humble studio in Pirnmill on 3/6/2016 gave me the rest." 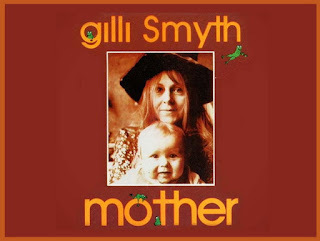 Esoteric Recordings cura la ripubblicazione ufficiale di Mother, classico album di Gilli Smyth del 1978, alla cui realizzazione concorsero Daevid Allen, Didier Malherbe, Christian Tristch, Pip Pyle, Pepe Milan, Juan Bibiloni e Sam Gopal tra i molti altri. Le note informative sul nuovo libretto sono a cura di Jonny Greene, mastro archivista responsabile di Planet Gong. Comprised of recordings dating as far back as 1972 (some featuring Gong), “Mother” is arguably one of the finest albums in the wider Gong family. Described as “A psychedelic, spacey invocation of motherhood, an examination of gender roles and reincarnation”, the album was mostly created in Mallorca by Gilli Smyth’s then-partner and Gong visionary, Daveid Allen, who also played on the album. The album also saw guest appearances from saxophonist Didier Malherbe, bassist Christian Tristch and drummer Pip Pyle among others. Featuring the customary Daevid Allen touch of imaginative edits and sound collages, “Mother” is a joy from beginning to end. This new, official release has been newly re-mastered and includes a booklet with liner notes by Gong archivist and expert Jonny Greene. 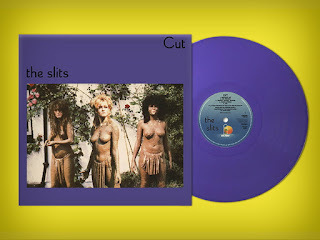 Scrive Vivien Goldman: "The outrage of Cut started with the sleeve of the girls almost naked, on their own terms, in an arguably romantic homage to the Papua New Guinea mudmen and indigenous peoples everywhere; a preoccupation shared with their firebrand friends, The Pop Group... Rather than titillating them, guys who usually enjoyed the bare-breasted Page 3 Sun girls of the time were alarmed by the girls’ defiant stance – a typical Slits perception flip. In the grooves, Cut epitomized what Marley called the Punky Reggae Party. How clever to ask Dennis Bovell of the pioneering UK British reggae band Matumbi to produce; his Sufferers Sound System was a favourite neighbourhood rave, and his productions made several chart hits out of British reggae and Lover’s Rock." Giunge al culmine la speciale settimana di eventi (Alterations Festival) organizzati presso gli spazi del Cafe Oto londinese dedicati allo storico gruppo Alterations, con diretti protagonisti i membri originari David Toop, Peter Cusack, Terry Day e Steve Beresford, tutti tuttora molto attivi e presenti sulla scena inglese dell'improvvisazione, della sperimentazione e del pensiero musicale. Gran girandola di amici e ospiti attorno ai Fantastici Quattro nei concerti di stasera e domani: Elaine Mitchener, Satoko Fukuda, Max Eastley, John Butcher, Lee Patterson e Blanca Regina - una delle principali promotrici del progetto - e poi Rie Nakajima, Evan Parker, Thurston Moore, Rhodri Davies, Hannah Marshall e Gina Southgate. 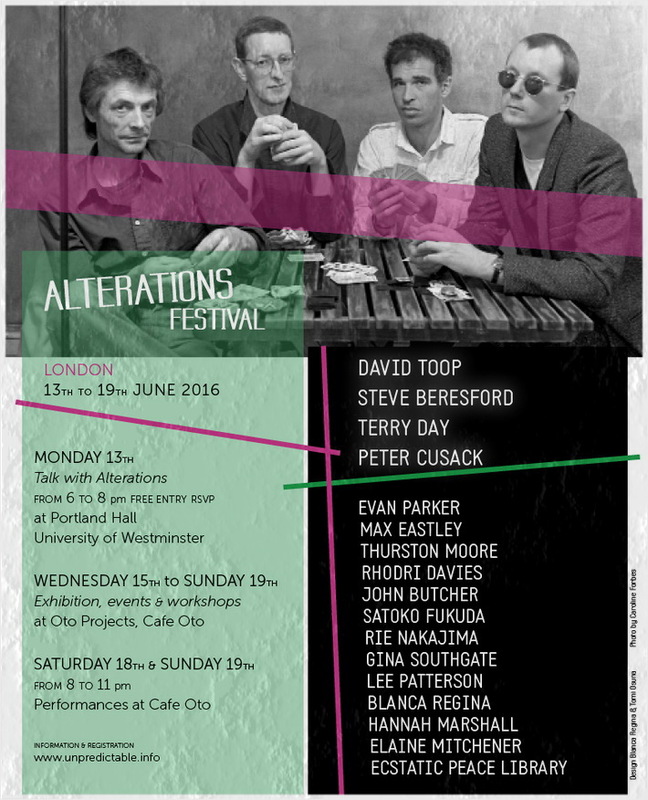 Alterations Festival (London 13th to 19th of June, 2016) presents activities around the subject of the group Alterations and explores the related fields of Sound Art and Free Improvisation. 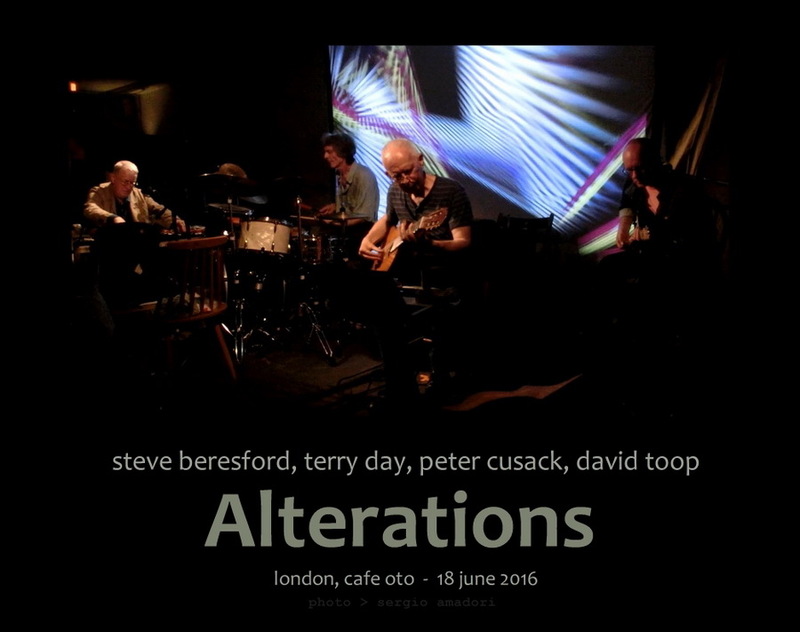 Alterations – David Toop, Peter Cusack, Terry Day and Steve Beresford – is a quartet of key thinkers and pioneers in music and visual arts. They played many concerts in the years 1977 to 1986 and came back together last year for one very successful concert. In the festival they will come together to collaborate in new contexts. Supported by Arts Council England and Sound and Music and curated by Blanca Regina and Beresford, the project engages artists and audiences in new ways of making and understanding music and art. 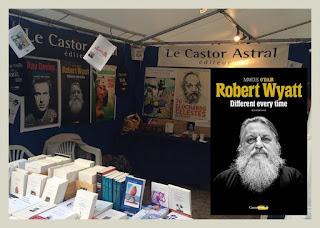 E' pronta per Le Castor Astral la versione in francese del libro di O'Dair su Wyatt Different Every Time. Ne sono curatori Pauline Firla e Louis Moisan. Ce livre offre des entretiens exclusifs avec un des derniers génies du rock. 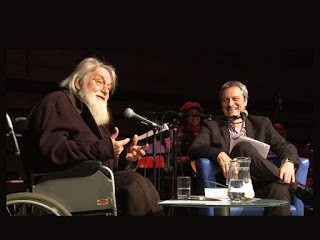 Marcus O’Dair a en effet rencontré Robert Wyatt à de nombreuses reprises afin de signer la première biographie autorisée et de référence. Accompagné de photographies rares, Robert Wyatt – Different Every Time explore l’univers d’un artiste complexe qui a connu la gloire avec Soft Machine, Jimi Hendrix et Matching Mole, qui a travaillé avec les plus grands noms de la musique, Brian Eno, David Gilmour, Nick Mason, Franz Ferdinand, et qui connaît une carrière solo hors du commun. Robert Wyatt apparaît ici sous de multiples aspects: de son engagement politique à ses influences artistiques, en passant par l’accident qui l’a paralysé à vie. 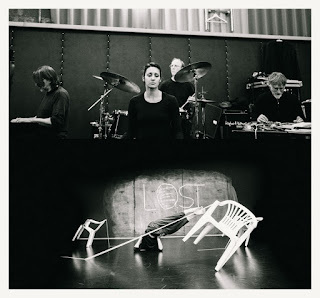 Bisognerà invece attendere la fine di settembre per vedere il lavoro di teatro-danza La Suite - sorta di prosecuzione ideale di uno dei capolavori della grande Pina Bausch, Café Müller, prodotto da Fabien Prioville per la sua Dance Company - cui Tim Hodgkinson partecipa come musicista di scena assieme a Emma Bonnici, Nikola Kodjabashia e Chris Cutler. Il debutto si terrà al tanzhaus nrw di Düsseldorf, ma un'anticipazione è stata offerta al pubblico in forma di prove aperte qualche giorno fa a Bonn. Tra i presenti c'era anche la fotografa e regista Mischa Lorenz, che ne divulga qualche scatto in http://www.mischalorenz.de/portfolio/photography/la-suite. Sempre varie e di grande interesse le proposte Cuneiform, scaglionate nel corso dell'anno a gruppi di sei-sette uscite quasi contemporanee: per maggio e giugno 2016 ci sono The Claudia Quintet, Super Petite; Deus Ex Machina, Devoto; I.P.A., I Just Did Say Something; Rez Abbasi & Junction, Behind the Vibration; Bent Knee, Say So e Thumbscrew (Mary Halvorson, Michael Formanek, Tomas Fujiwara), Convallaria. 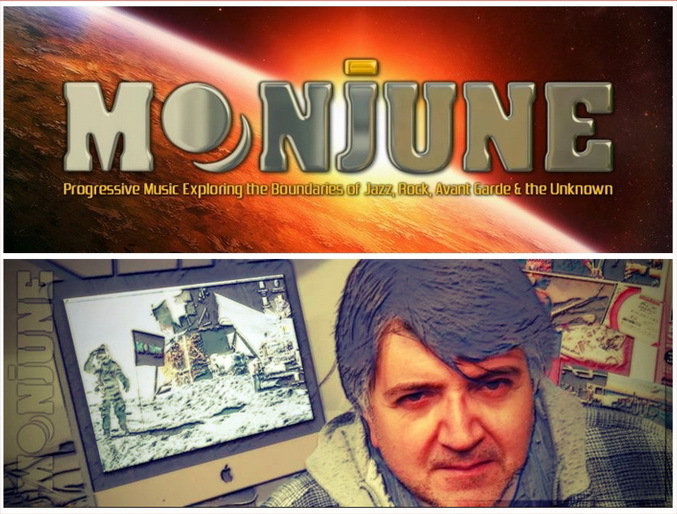 Compie quindici anni di attività l'etichetta MoonJune Records diretta da Leonardo Pavkovic, e i festeggiamenti si estendono all'intero mese di giugno con promozioni speciali e materiali variamente offerti dal vasto catalogo. "I have never thought - confessa Pavkovic - I would be arriving to this point when I started the label in June 2001 with my first three releases, launching since then the total of 79 great albums of progressive music that explores boundaries of Jazz, Rock, Avant, Ethno and The Unknown. 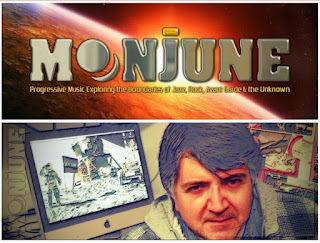 MoonJune artists are congregating from various parts of the world - Indonesia, United Kingdom, Brazil, Spain, Japan, Uruguay, Serbia, Canada, Belgium, Israel, USA - into one friendly place, which is the Planet MoonJune's Extended Family, and in the name of all my artists, I thank you all for the great support during all the fifteen years". Auguri! Lussuose ristampe in vinile di English Settlement (1982) e Skylarking (1986) attendono a metà luglio i collezionisti di ogni cosa XTC. Si possono prenotare già ora tramite Burning Shed. 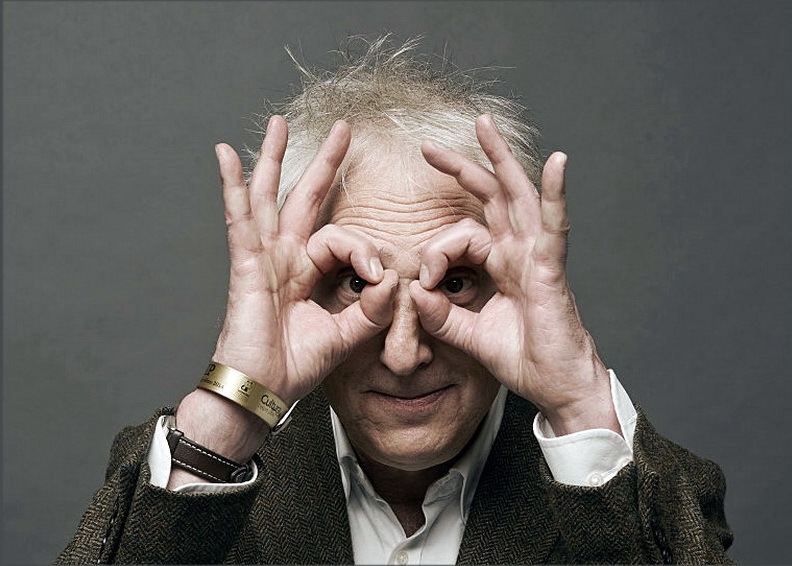 Il programma di Radio 3 della BBC Between The Ears trasmette domani sera, alle 21.15 ora locale, un nuovo lavoro radiofonico di Peter Blegvad, The Impossible Book, un'allucinata odissea nel tempo e nello spazio compiuta da uno scrittore - anzi, dalla pluralità di scrittori che in lui risiedono - in viaggio su un treno, suggellata dall'apparizione nientemeno che di Agatha Christie. 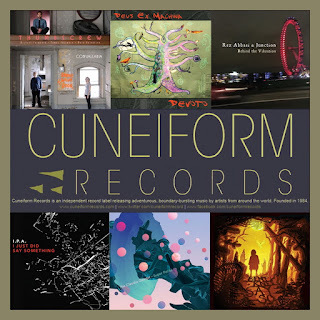 Fenomenale il cast di voci e attori: oltre al doppio Blegvad ci sono Andy Partridge, David Thomas, Harriet Walter, John Guerrasio, Aldo McKinney e Sophie Duval nelle ambientazioni sonore create e dirette da Iain Chambers. ‘The Impossible Book’ is the latest collaboration between composer/producer Iain Chambers and writer/performer Peter Blegvad. The two have form in the field of experimental radio drama having won a Sony award and Prix Europa Special Commendation in 2012 (for ‘Use It Or Lose It’), been finalists in the 2014 Grand Prix Nova International Radio Drama Festival in Bucharest (for ‘Chinoiserie’), and been nominated for the Prix Europa in 2015 (for ‘The Eternal Moment’). As with those previous works ‘The Impossible Book’ uses radiophonic sound design, music and treated voices to capitalize on radio’s unique ability to depict subjective states, to project dreams and evoke mental imagery. A sorprendersi un po' dell'esistenza del documento, più o meno ufficiale, è per primo lo stesso Chris Cutler, che lo diffonde prontamente tramite ReR nel doppio formato in vinile e compact disc: Etron Fou Leloublan dal vivo all'evento di Rock In Opposition, uno di quelli originali, al New London Theatre il 12 marzo 1978. I brani offerti dal trio - allora Guigou Chenevier, Ferdinand Richard e Francis Grand - ai circa cinquecento presenti erano Pourrissement Des Organes Intérieurs, Sololo Brigida, Nave De Bilande, Le Fleuve Et Le Manteau, Face À L'extravagante Montée Des Ascenseurs Nous Resterons Fidèles à Notre Calme Détermination, Percutant Reportage Au Pays Des Fées. Scrive Cutler: "Not sure how the band tracked down this very plausible recording made at the obscurely famous RIO festival in 1978, but here it is, cleaned up and pressed into vinyl. The sound is good, clear and persuasive, with the occasional minor glitch. 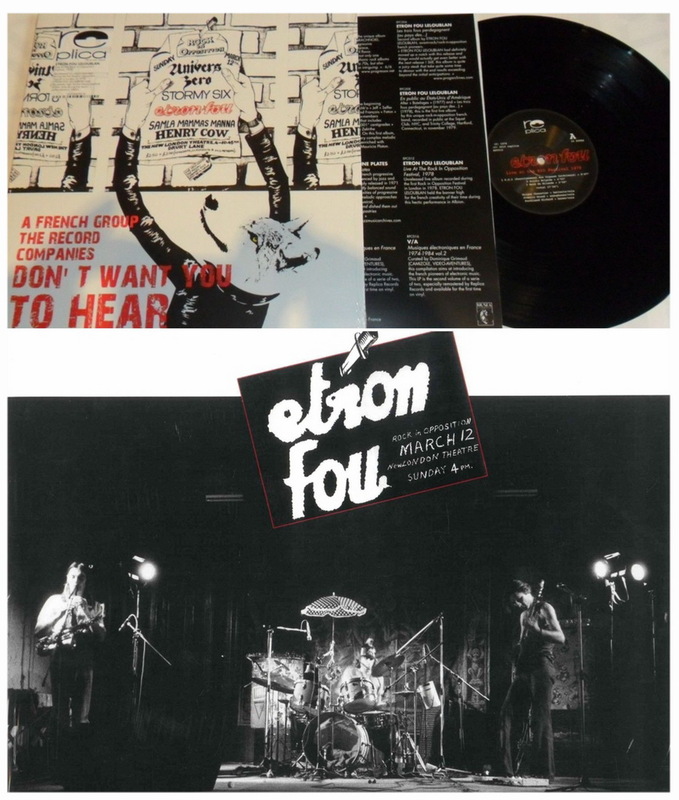 This was Etron Fou in their prime, totally on top of their frantic, complicated and highly eccentric programme. Bonuses: Ferdinand’s spoken introductions, a rare, highly individual solo from drummer Guigou Chenevier (don’t worry, it’s not the usual crash-fest) and great playing from everyone. 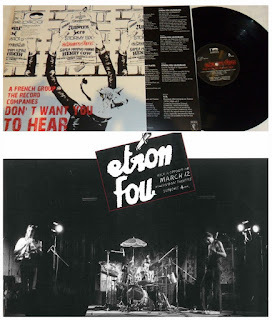 In a class of one, EFL had their own unique take on what you can get away with, and they’d evolved their own musical language, remaining adamantly French - that’s why they were part of RIO, of course - with a strong penchant for the bizarre. It’s hard to remember there are only three of them with all that stuff going on. And a little tranche of history... "
L'australiana Room40, nella persona del suo curatore Lawrence English, ha convinto David Shea a comporre ed eseguire di persona un intero album di musiche per solo pianoforte. Una sfida non da poco, e da questi mai affrontata prima, ma l'esito è positivo: Piano I. "Although I’ve always played and performed on keyboards in my solo and ensemble works - dice Shea - I never took on the huge task of being able to play the technically challenging (at least by my standards) the type of scores I had written for others. So I spent a year unravelling my past approach to composing for piano and explored my own physical technique. No preparations, no samples, no extended electronics or reliance on my past sample acoustic techniques. The result of this year of practice, writing, listening, exploring and recording is this CD. 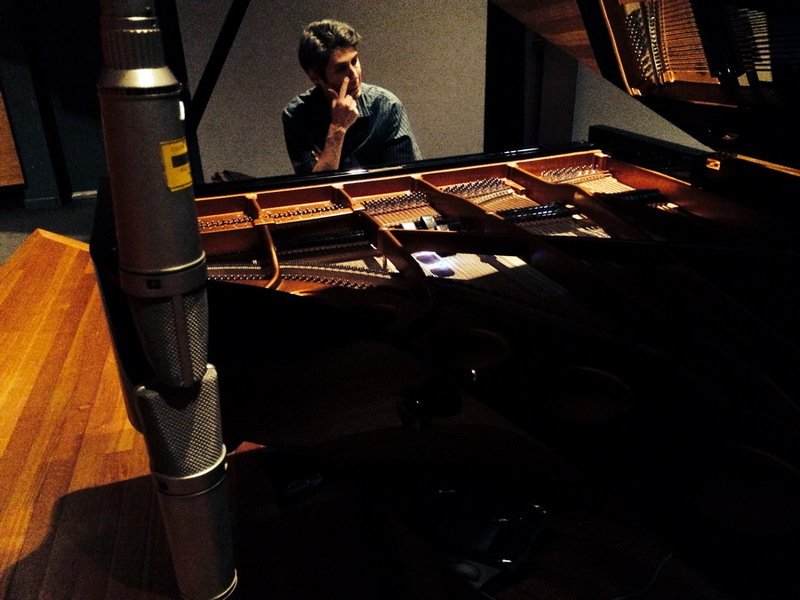 Whether or not it is significant that a work is purely acoustic, prepared or electro-acoustically treated, fully composed or improvised, extended or played traditionally etc, were not the central issues for me. It was this time spent with the piano, the ritual of playing and this re-working of my own physical and conscious process that forms the core of these pieces." A fianco dei gustosissimi Kangaroo? e Black Snakes nei primi anni Ottanta maturò un altro frutto dall'alleanza di Red Krayola con Art & Language, che allora nessuno colse. Rimedia oltre trent'anni dopo l'etichetta Drag Ciy: Baby and Child Care, con Mayo Thompson, Allen Ravenstine, Ben Annesley, Chris White e i famigerati consigli pediatrici di Benjamin Spock ripresi da Michael Baldwin e Mel Ramsden. 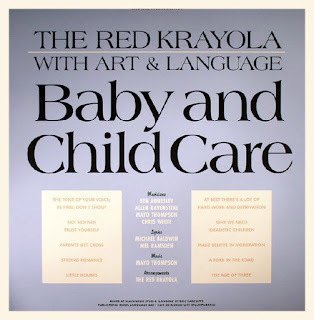 Grooving sinuously in prime mid-80s form in a production redolent with funk, dub and new-wave inflections, Baby and Child Care is of a musical vintage whose dry complexity is even more appreciable today. The revolutionary advice found within The Common Sense Book of Baby and Child Care opened doors in the mid-40s that are widening still; at the time of this album project, it had influenced a generation or two of generally young parents. At that time, The Red Krayola were a band on a musical roll, having just recorded and released Black Snakes on the Swiss Rec Rec label. When presented with the lyric qualities of Dr. Spock's psychoanalytic texts, passages of which had been transposed by Art & Language's Michael Baldwin and Mel Ramsden, Mayo Thompson immediately set them to music. The Red Krayola 'Black Snakes' band - Ben Annesley on bass, Chris White on drums and Allen Ravenstine on synthesizer and soprano sax - provided musical accompaniment in performances recorded by Eric Radcliffe at Blackwing Studios in London. Thirty-two years later, the conversant playing and production approach of Baby and Child Care comes across with an enduring completeness that belies its position on the shelf for the past several decades. 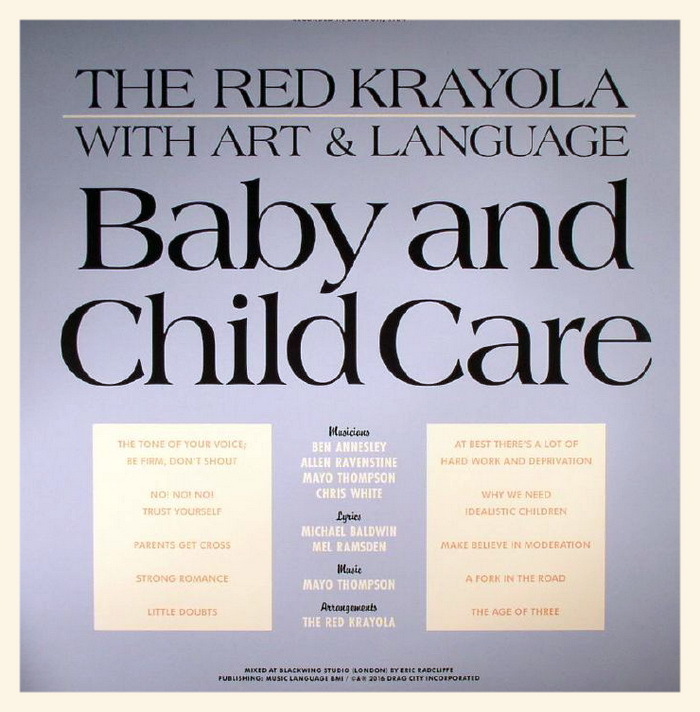 Despite the initial lack of release, its pride of place can now be appreciated, an example of the Red Krayola's particular brand of collaboration. Standing tall next to the already-known classics of early-80s Red Krayola, from Kangaroo? through Three Songs on a Trip to the United States, Baby and Child Care is essential listening for parents and progeny alike. 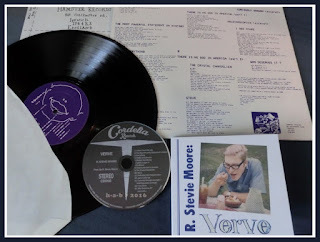 Torna in circolazione uno degli album più sperimentali del primo R. Stevie Moore, Verve (in origine per l'inglese Hamster, 1985), che pure ebbe maggior circolazione e notorietà rispetto a successivi documenti ufficiali. Lo ripubblica meritoriamente Cordelia Records, aggiungendo a questa prima edizione in cd parecchio altro materiale. 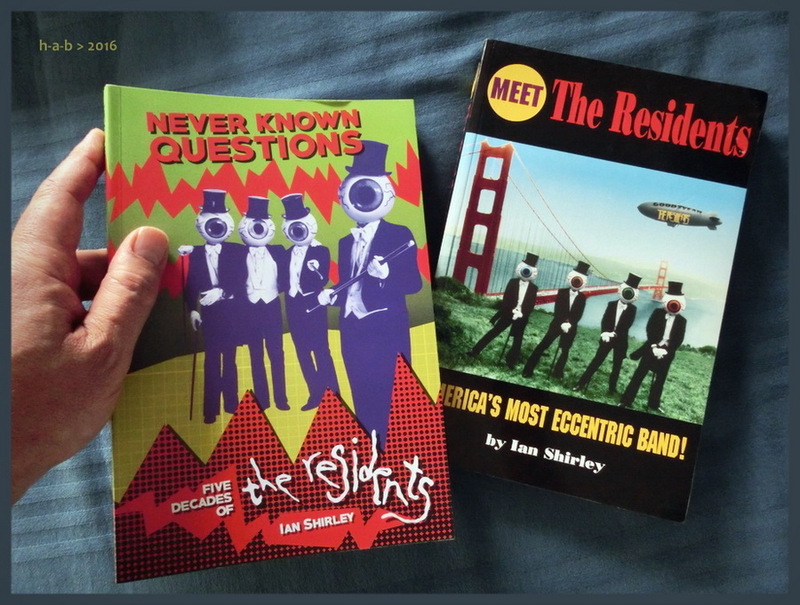 Non ha semplicemente aggiornato la precedente versione del suo libro sui Residents (Meet The Residents, SAF 1993), Ian Shirley lo ha praticamente riscritto ex novo: il titolo è ora Never Known Questions-Five Decades Of The Residents, per Cherry Red Books. Since their inception in the early 1970s, The Residents have confused, confounded, and delighted fans and critics for more than 40 years. Shrouded in anonymity, the band has charted a course with no beginning and no end that has taken them to the outer limits of entertainment and audience expectations. From their debut Santa Dog single, through warped sonic tributes ranging from the Beatles to Hank Williams, mysterious recordings made among the Inuit, iconic eyeball imagery, and collections of one minute songs to jaw dropping live shows, innovations in audio visual technologies and social media, conceptual albums and tours, abandoned film projects and eventual semi de-masking to reveal the slightly unsettling Randy Rose, the band is unquestionably one of pop’s most innovative acts. Never Known Questions delves deep into The Residents’ psyche, charting their rise from cottage industry imagineers to art pop figureheads and exploring 40 plus years of chameleonic musical adventures, along with the lore and legend that has built up around the group. 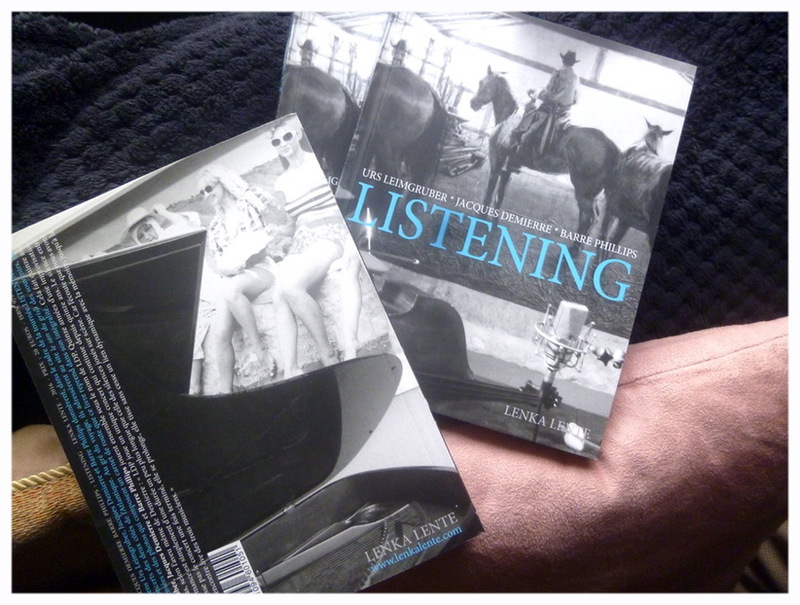 It covers such questions as Were they really Talking Heads and Brian Eno in disguise? What is a Cryptic Corporation? Who was Nigel Senada? Did they really forget about recording an album? How’s Randy doing now? And what kind of a band sells a fridge full of records for $100,000 anyway? 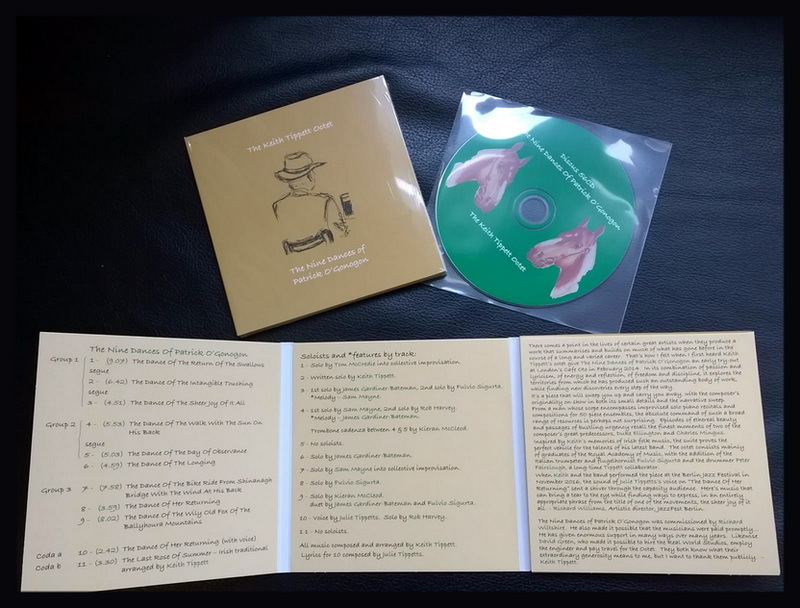 The French imprint Lenka Lente has published a slim volume of poetic couplets by the late US composer, instrument inventor and street musician Louis Hardin aka Moondog. 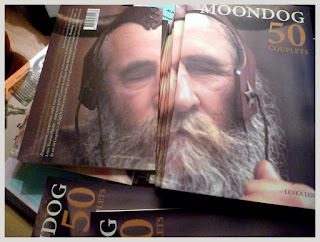 Called 50 Couplets, the 40 page bilingual pamphlet includes the original English and French translations of Moondog’s words of wisdom, which he typically expressed in two line rhymes. The pieces making up 50 Couplets mark a progression from those earlier writings. Belhomme calls them “small fairy tales, love stories or even insults that tell about philosophy, history, environment, politics, economy… We could think of Ralph Waldo Emerson and Henry David Thoreau, as Moondog often refers to nature - reminiscences of his childhood maybe, fishing, hunting, riding horses in Wyoming. But, indeed, it’s possible too that Moondog had one and only one influence: himself. 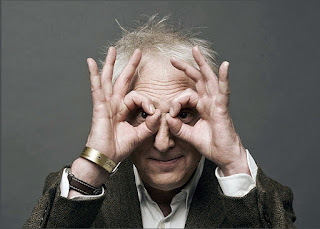 Dopo esser stato ospite nella sua forma in progress del blog Le son du grisli, il diario di bordo che Urs Leimgruber, Jacques Demierre e Barre Phillips hanno tenuto lo scorso anno durante una serie di concerti su entrambe le sponde dell'Atlantico è ora un elegante volume ricco di aneddoti e di riflessioni edito da Lenka Lente: Listening. Per l'estate l'Ecstatic Peace Library di Thurston Moore promette di recuperare e ripubblicare in facsimile in unico volume rilegato l'intera collezione di Musics, ventitre numeri bimestrali autoprodotti tra il 1975 al 1979 nel cuore della scena londinese di musiche e arti di ricerca e di improvvisazione. 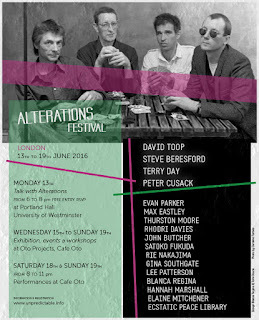 L'iniziativa sarà presentata ufficialmente a Londra al Cafe Oto nei giorni dell'Alterations Festival con l'intervento degli editori e di alcuni diretti protagonisti (Beresford, Toop, Cusack e forse altri). From 1975 to 1979, London improvisors published the most innovative artists and musicians of their generation in the magazine Musics, a blueprint for the interlinked activities we now call sound art, field recording, improv, live electronics & audio culture. It came out six times a year and ran for twenty-three gorgeous issues. 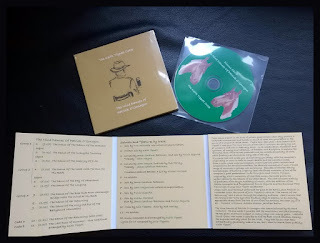 Derek Bailey, Evan Parker, John Zorn, David Toop, John Russell, The Feminist Improvising Group, Bob Cobbing, ICP, Val Wilmer, Annabel Nicholson, Han Bennink, Eddie Prevost, David Cunningham, Steve Beresford among many others were contributors. 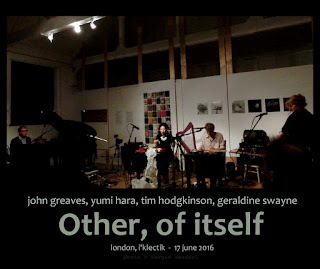 The journal covered improvised and non-western music alongside performance art, reflecting the broad interests of the so-called “second generation” of London’s improvisers, and provided a convivial focus point. Overlapping with London musicians’ collective (LMC), the publication first launched in Spring of 1975, with the tagline: an impromental experivisation arts magazine and a manifesto that proposed the destruction of artificial boundaries, and linked Free Jazz, the works of John Cage, and indigenous and non-European music.